Our monostrap school bags are available in 5 bright colours. 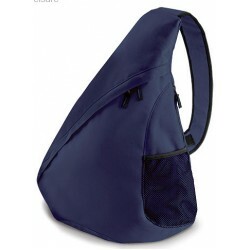 Ideal bags for older school ages or colleges students. Our monostrap school bags are made from 600D polyester fabric, with a ziped side pocket and a mesh pocket for a ipod/MP3 player. Embroidered monstrap school bags are available from as few as 6 bags, further details and prices upon request. Black Monostrap School Bags Bag size 48x37x14cm Black 600D polyester fabric Monostrap ..
Navy Monostrap School Bags Bag size 48x37x14cm Navy 600D polyester fabric Monostrap sc..
Orange Monostrap School Bags Bag size 48x37x14cm Black 600D polyester fabric Monostrap.. Bag size 48x37x14cm Red 600D polyester fabric Monostrap school bags BG211 Zipped side pocke..
Royal Blue Monostrap School Bags Bag size 48x37x14cm Royal Blue 600D polyester fabric ..